Superior carding depends a lot on the quality and maintenance of tops being used. At ICC, we understand this need and thus manufacture high-quality tops as well as re-sharpening tools for them. Sharprite tops with brush and grinding wheels ensure a thorough cleaning of the wire points for consistent performance. Our patented feeding mechanism allows precise adjustment of the grinding roller to the flat wire tips, so that a grinding depth up to one thousand of an inch is achieved. Our cam feeding system eliminates the trouble of frequent corrections and readjustments during grinding. Our stylish integrated device, not only combines the activity of cleaning and re-sharpening of wire tops in a single device but also minimises the overall time of performing these operations. 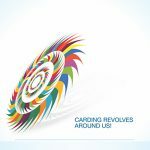 Let your fibre speak volumes about your quality carding by using ICC’s Sharprite tops and re-sharpeners.